It works like a mouse, but looks and feels like a pen! 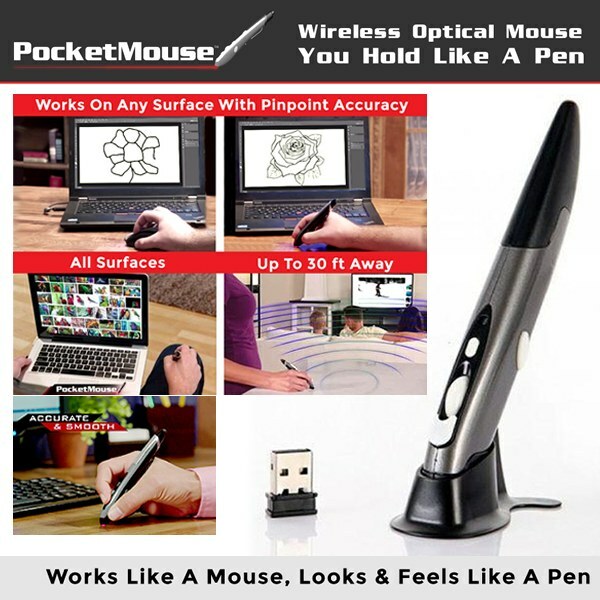 Pocket Mouse the is a wireless optical mouse you hold like a pen with enhanced optical technology that let you work on any surface. The pen design and wireless technology replicate your hand movement. Effortlessly and accurately write, click swipe and scroll. Just flip it over and it doubles as a stylus. It&apos;s so compact and portable, it even fits in your pocket! The ergonomic design is great for people with hand and wrist pain and works with any device that accepts a USB mouse, so there&apos;s no extra software required. Compatible with desktops, laptops and USB-enabled tablets, and works from up to 30 feet away. Includes: Pocket Mouse, USB connector, instruction sheet, desktop stand. Supports Windows XP, Windows 7, Windows 8, WIndows 10, Linux, MacOS, and more. Easy to operate & saves time.